Success here is not just about being an expert in procurement and supply. It’s about sharing our passion for innovation as well. We need people who are interested in shaping the future of healthcare and helping us meet our customers’ constantly changing needs. If you’re looking to build a long-term career in procurement, then this is a great place to start. Join us as a Buying Assistant or Supply Analyst, and you’ll have the potential to progress in many different directions both within the department and across the business. There will also be opportunities for you to create long-lasting relationships with manufacturers and to contribute to lots of different transformational change projects along the way. 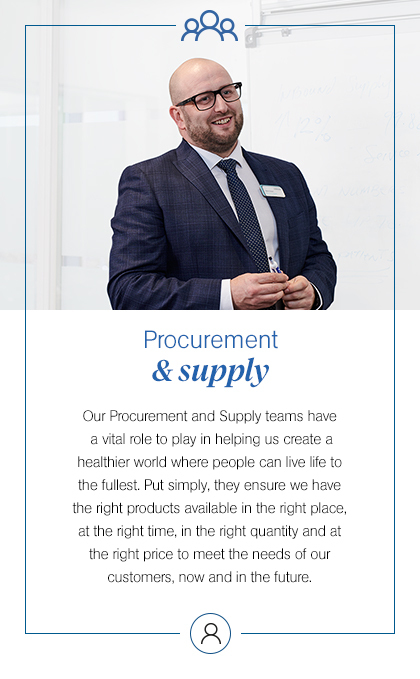 Explore our Procurement and Supply teams to see where you fit in. This team works right at the heart of the action, ensuring customers get the products they need, when they need them. Responsible for purchasing and proposition development for generic medicines, and for managing specials and branded ethical commercial deals for LloydsPharmacy, AAH and Trident. This team has commercial responsibility for ethical products sitting outside of PharmaCo and medical devices listed in Part IX of the Drug Tariff. This includes responsibility for sales strategy development and procurement.